The most recent versions of Management Standards (ISO 9001:2015, ISO 14001:2015) have identical structure for integration purposes. When implementing 14001 within existing 9001 should both systems - QMS and EMS be implemented as separate ones with separate documentation, or may EMS be included as one of QMS processes? Manual gives detailed description of the IMS processes and their interaction. (Click to download a sample IMS processes interaction diagram) The depth of the description is enough for the Organization to decide that this IMS Manual is the only IMS document, which summarizes all mandatory Procedures as well as the procedures that regulate processes in accordance with the existing good practices. This could be a rational decision of the Organization that provides services for small and mid-size manufacturing companies. Our template is more than just a sample. Easily customize our template and you'll instantly have your entire and complete ISO 9001:2015 + ISO 14001:2015 IMS Manual to your individual Organization. 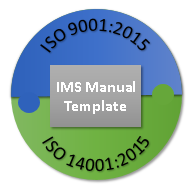 Our template gives you an ideal starting point and jumpstart for your ISO 9001:2015 + ISO 14001:2015 IMS implementation.